This story by Deepa Fernandes  originally appeared on PRI.org  on June 11, 2017. It is republished here as part of a partnership between PRI and Global Voices. As 19-year-old Francisco Duarte watched his parents handcuffed and driven away by immigration officials in late May outside their San Diego, California, home, all he could do was console his hysterical 12-year-old twin sisters. Then he took off to find help for his parents. They would need an immigration attorney, and Francisco would need to gather their paperwork. His younger brother Luis, 17, stepped up to look after the younger sisters — he cooked them eggs and ham when they came home from school that day. The brothers were busy figuring out all the household chores, making sure they had their little sisters taken care of. And then it hit the brothers. Rent was due in less than a week. They were now going to have to pay all the family’s bills. Duarte said he and his brother gathered all the money his parents had. It came to $2,500. They would need to supplement their father’s income somehow. He was the breadwinner, running the family ice-cream business. “My mom and my dad met selling ice cream from pushcarts 20 years ago when they came to this country,” Duarte said. 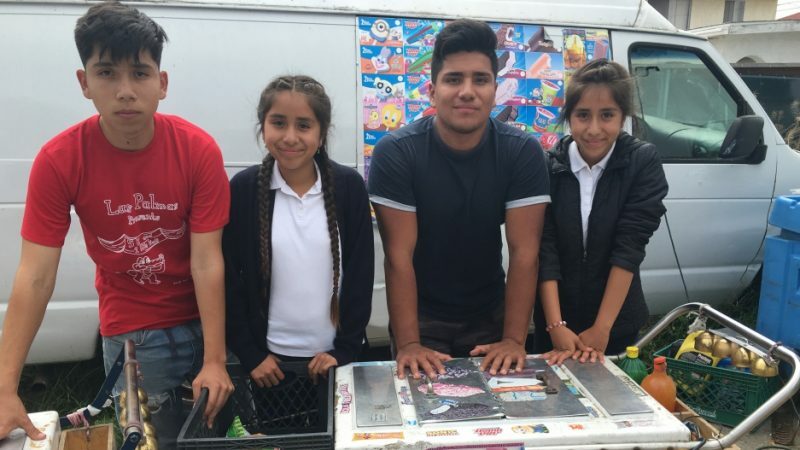 While Francisco and Luis push their own ice cream carts to help out, neither could bring in the money that their farther did, Duarte said. Francisco Duarte Sr. and his wife, Rosenda Perez, were arrested by immigration agents on May 23. Duarte had left his National City, California, home to buy a newspaper across the street. His wife came out to see what was going on and she was arrested too. Officials say they have been charged with “immigration violations” in the US. There are no criminal charges against them, and neither has a criminal record. The San Diego couple are among a growing number of non-citizens arrested on civil immigration charges during the first months of the Donald Trump administration. From January 22 to April 29, more than 41,000 people suspected of living in the US without proper authorization have been arrested by federal agents — nearly a 40 percent increase from the same period in 2016, according to US officials . A quarter of those arrested are charged with being in the US without legal status, but have no prior criminal records. It’s a group that was not targeted as heavily by the Barack Obama administration. The latest numbers show Trump is making good on his campaign promise to change that, as detailed recently by reporter Maria Sacchetti at The Washington Post . Before his arrest, Duarte was able to pass custody of his three younger children to Luis, his oldest son. For the kids, it’s been a whirlwind. On a recent Tuesday, Francisco sought commmunity members to write letters of support for his parents. Mark Lane, a legal assistant at an LA-based immigration law firm, sat with Francisco, and they discussed what else needed to be collected for his parent’s case. Lane was one of the people Francisco called for help the day his parents were arrested. Lane, whose firm has taken the case of Francisco’s parents, talked to the kids about the expenses they would need to pay. All four children are in school, leaving little time to work and bring in income. So they decided to turn to a terrain they know well: social media. They created a short video about their situation, posted it to YouTube, and linked it to a GoFundMe fundraising page. They set their fundraising goal at $70,000 and, just days later, they had surpassed it. More than $72,000 in donations have come in so far. But it wasn’t just money rolling in — people were also reaching out to say we support you. “It’s just very uplifting that every day I get messages from people and they’re just letting me know that they’re there for me and if there’s anything that I need they’re just a phone call, a text away,” Francisco said. The older Francisco found it hard to comprehend the social media campaign his kids are pursuing on his behalf, his son said. During a recent phone call, the younger Francisco explained to his father how money and support was coming in. His dad asked who was donating. “Many people,” his son told him. “Teachers, neighbors, friends, people from around the city,” he told his father during their telephone conversation. As word spread on social media, friends began coming by the house to help. A group of Luis’s friends from school are helping out. Luz Maria Castañon said they don’t want Luis to suffer at school. In the kitchen, another friend, Maria de Jesus, cooks up some tacos. She said should would cook for the children until their parents come back home. The twin sisters, Aracely and Yarely, watched their parents get handcuffed and be taken away by immigration officials. It was confusing, Aracely said, and they miss them a lot. Especially when they come home from school. “Usually my mom would be here and she would sometimes have a little snack prepared,” Yarely said. The girls are not identical twins, but they both have the same sweet, kind of sad smile. They busy themselves putting things away in their room. “Sometimes it is a bit overwhelming but, um, …” Yarely trails off. Luis checks in on his sisters, makes sure they are OK, and then has to leave. “I’m going to go and do laundry right now because our sheets are really nasty,” he said. Is this his job normally? After the laundry, he has to be home for his sisters. His brother will continue gathering letters of support for their parents. “I understand how hard it is to take care of little kids now,” Luis said.